Why The Push for STEM Education? One of the new trends in science education is the push to focus on STEM (Science, Technology, Engineering and Math) in the classroom. USF Engineer Gino Gonzalez after retrieving the SIPPER 3 device. Incorporating math in a science classroom is easy as you can’t really have one without the other. I love bringing authentic data sets to the math classroom so I can give students an answer to their “why do we need to learn this” questions. In terms of technology, there are so many wonderful tools out there, and the research resources available online are amazing, means that adding in the “T” makes sense. It is with the “E” that I run often struggle. Lucky for me, we have several engineers on board, and Gino Gonzalez, the engineer running the SIPPER project on board let me pick his brain on the subject. I’ve mentioned the SIPPER device earlier, and talked about how it is designed to take pictures of organisms as the boat pulls it through the water. It is the perfect example of how scientists need engineers, and why STEM makes sense. I think of it like this. It is science’s job to work out what questions to ask, and what kind of data will answer that question. Sometimes the tests are out there and the protocols and procedure have been long established. Sometimes, however, we have to invent a tool that will give us the data we need. This is where engineering comes in. 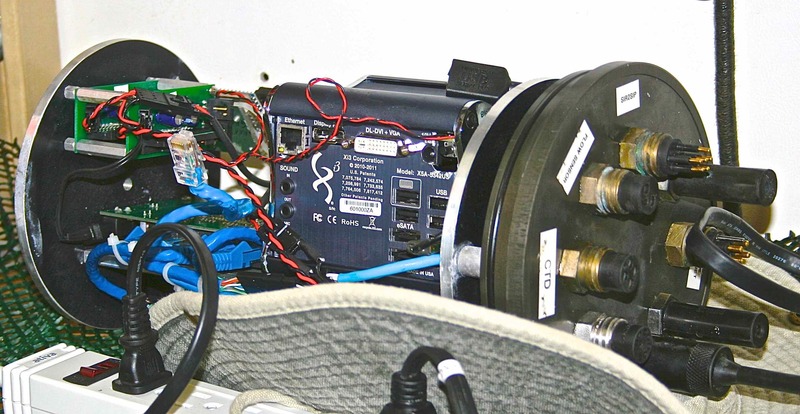 A scientist may know exactly what they want to measure, but it may take the mechanical mind of an engineer to work how to build the device that can collect that data. Very often, you find that the scientist and the engineer end up being the same person, and the scientist invents the tools they need to collect the data they want. Often it takes teams of scientists and engineers years for devices to be refined and improved so that the data they collect really answers our questions. Not your average AA Battery! USF Graduate student Tim Lee changes the battery on the SIPPER 3 device. The story of the SIPPER (Shadow Image Profiler And Evaluation Recorder) devices on board is the perfect example of STEM at work. In the 1970s, engineers were tasked with a way to streamline quality control in factories. Instead of having Lucy and Ethel tossing chocolates off the assembly line, cameras were used to take pictures of the products and giant computers were programmed to recognize anomalies in expected shapes. For example, a blank in a pill packet or broken threads in a garment would be caught on camera and pulled from the line. 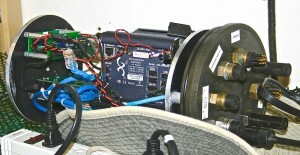 By the 1980s the major oceanography institutes were challenged to adapt this technology to monitor particulates in water. In that first incarnation the computer was the size of a five-gallon paint bucket and had to be towed on a sled the size of a pickup truck. This cruise we have two SIPPERS on board, the tried and true #3, which has given us exciting data on previous cruises. This is also the maiden voyage of the next generation SIPPER 4 device. 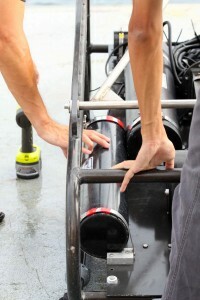 The SIPPER devices are designed to take super high resolution photographs of the water that flows through a tube in the device as it is dragged behind the boat. Rather than light the water in front of the camera like a camera flash, the water passes over the light field with the camera on the other side. This highlights the outlines of the organisms in the water. This information is relayed back to the boat and stored in huge data files. Artificial intelligence software recognizes and counts the groups of plankton species in the water sample. Along with the images, the device carries conductivity, depth and temperature sensors and attaches that information to the image files. Because of the way SIPPER 3 records the data, scientists on board don’t have access to real time images, and if something goes wrong with the equipment the entire run of data might be lost. The image that is produced is 4 inches wide, and usually 15 miles long (yes, miles!). To read the features of the plankton, a person needs to magnify it about 20 times, meaning if you were going to print that image it would be over 6 feet high and 300 miles long! Imagine how long it would take a person to count the data contained in that image. USF contractor Kurt Kramer is selecting processed images from the SIPPER 3 device. The closeup photo of the eel is zoomed in at least 20 times magnification from the actual image taken by the SIPPER's camera. The new Sipper 4 uses exciting new technology to improve on the capabilities of its predecessor. Instead of a bucket sized computer, the whole thing is about the size of a Rubics cube. It can sample a 4 X 8 inch area of water and produces 2 images a second. It can go deeper than the earlier devices, and it collects data on conductivity, temperature, pressure, and depth, florescence (a measure of the chlorophyll in the water), and turbidity while it takes pictures of the plankton. This tiny cube computer is the heart of the powerful SIPPER 4 device. One of the most important improvements is that it is far more flexible and customizable source of data. A scientist doesn’t have to download and process terabytes of data anymore, but can isolate the data that is relevant to the questions they are investigating. 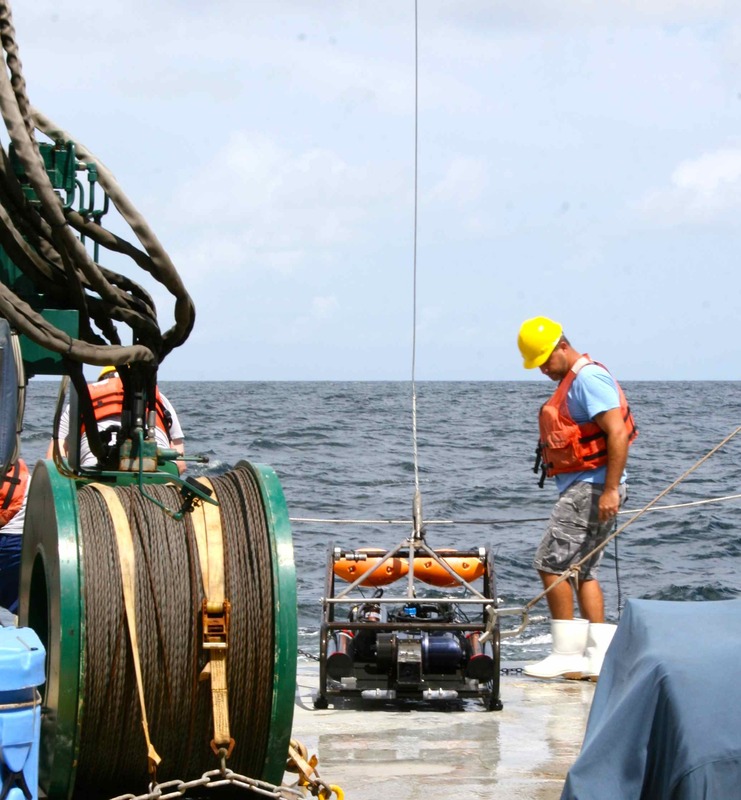 And most exciting, the device can connect to the internet, which means scientists do not have snag a spot on a research vessel to access the data, but can work with it in their lab thousands of miles away! In the not so distant future, this technology might allow students to guide remote operated SIPPER devices from their classrooms to collect real time data from deep ocean sites, and we could have 24hr monitoring stations with data open and available to everyone. Now, admittedly, the deployment hasn’t been without issues (SIPPER 4 is currently a little damp and won’t be going back out this cruise), and Gino has spent long days and nights troubleshooting the two devices. But I get the sense that engineers may joke about cutting cables and tossing it overboard, but the challenge of improving and fixing their “toys” is what drives them to be engineers in the first place! As the tools get better, better data is available, and scientists ask better questions, and the engineers have to make more tools. Print article This entry was posted by greely on August 9, 2013 at 11:54 am, and is filed under Oceanic Updates. Follow any responses to this post through RSS 2.0. You can leave a response or trackback from your own site.